I'd longed to buy the Ikea Duktig Play Kitchen from the moment I found out I was pregnant but it wasn't until a friend pointed me in the direction of people customising these babies on pinterest that I become fixated with the idea of doing ours up and settled early on in 2015 that it would be ideal for Ivy's second birthday present. This gave me plenty of time to complete the project so I cannot believe I am actually writing this post already with the end result, hurray! Leave yourself plenty of time to complete the project if working to a deadline like a birthday or Christmas but not so much time that you are too care free about it (ahem) and then panic when you realise it's been sat in the garage unopened for 2 months. Remember to factor in time for building, multiple coats of paint AND drying inbetween. Also set aside plenty of time to go to Homebase, approx. 5 times because you'll discover you need something else during each session. The overall time for this project was approximately 6 man ours, over several weeks. I built the main unit before I painted it purely because I realised I needed to make a start on the whole thing and hadn't bought the paint. If you've built the entire thing prior to upcycling, just use masking tape where necessary. For the painted sections, I used one coat of wood primer, 3 coats of Dulux Matte paint and two layers of quick drying clear matte varnish. I applied the paint with a mini roller and primer and varnish with a brush. Important: If this is not your first project, practice on something else first. No amount of YouTube tutorials are going to solve your problems, it really is just practice and finding which techniques work for you (I learnt this the hard way). I used Ikea wooden desk draws until I got the hang of it. I had bought some knobs to put above the oven door but having completed the project, I was too scared to ruin it by taking a drill to it. Maybe at a later date. If you search pinterest, there are some incredible splash back designs added to the back of the unit. I have also been told this stops toys being lobbed behind the kitchen! 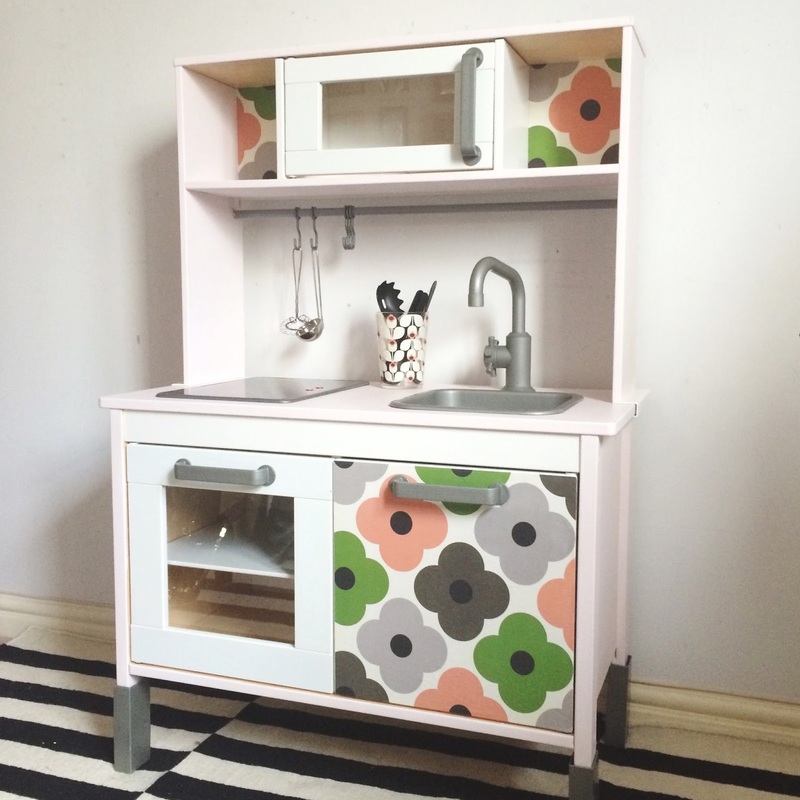 Have you upcycled the Ikea Play Kitchen? Or thinking about doing so? Get chatting on instagram @amyrosewatts for any other 'advice' or purely to show off your creations! I'd love to see!